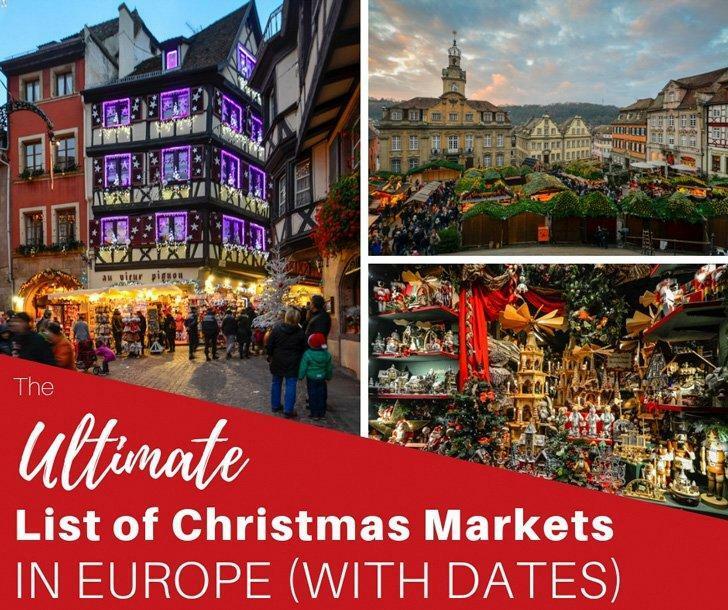 We share all of the Best Christmas Markets in Europe with Dates for 2018, including the best Christmas markets in Belgium, the top Christmas Markets in Germany, beautiful Christmas Markets in France, the UK, and lots more. The holidays are a magical time in Belgium and around Europe. Nothing is more festive than strolling through decorated chalets, brimming with gift ideas, with a hot cup of mulled wine in your hand. Of course, stopping along the way for tasty holiday food is a great part of the experience too. On this page, we’ve rounded up as many of the best Christmas Markets we can find, in Belgium and around Europe. We’ve included the massive month-long markets, as well as the smaller, local fairs that happen for only a day or two. We make every effort to keep this page updated with the latest information but please be sure to check the official websites before making your travel plans. We’ve written a HUGE article about the best Christmas Markets and holiday events in Belgium. Also, don’t miss our post on the 13 Best Christmas Markets Around the World contributed by top travel bloggers. Winterland Hasselt takes place between Nov 24 and Jan 6 at Colonel Dusartplein in Hasselt. The American Women’s Club of Brussels hosts its annual Holiday Bazaar at the AWCB Clubhouse on Dec 8-9. Snow and Ice Sculpture Festival takes place in Bruges, at the main train station, from Nov 24 until Jan 6. Bruges Christmas Market takes place between Nov 23 until Jan 1 in the Grand Place. The Scandinavian School of Brussels hosts the Danish Christmas Market selling English books, food, and Danish cheese on Nov 24. The Watermael-Boitsfort Christmas Market is Nov. 29 – Dec. 2 on Place Wiener-Payfa. Liege Christmas Village the largest one of it’s kind in Belgium, it takes place between Nov 30th and Dec 30th, on St Lambert square and Marché de Liege square. 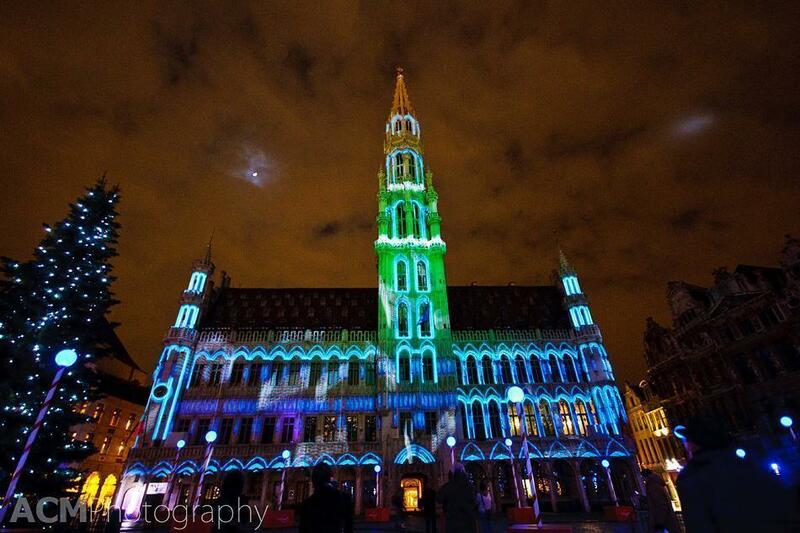 Brussels Winter Wonders takes place between Nov 30 and Jan 6 in Place Sainte-Catherine. Christmas season in Oostende begins Nov 30 until Jan 6. The Christmas Market in the Hautes Fagnes nature park. 2018 dates coming soon. During Christmas at Floreffe Abbey, artisans display the fruits of their labour: engraving on glass, textiles, ceramics, wood, and metalwork. 2018 dates coming soon. 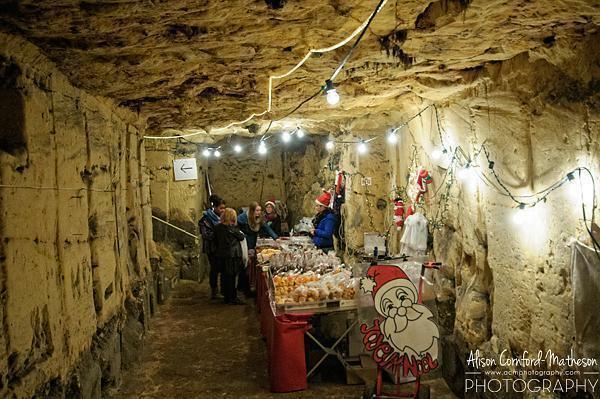 Christmas at Maredsous Abbey A Christmas market worthy of the name; over 20 chalets and many activities are offered to visitors between Nov 23 and Dec 31, every Friday from 6 pm to 10 pm and Saturdays and Sundays from 10 am to 8 pm. Charleroi Christmas Village The Christmas Village of Charleroi, the ice skating rink, exhibitors, spaces dedicated to children and other surprises are back from Nov 30 to Jan 6. Winter in Antwerp begins Dec 8 until Jan. 6. Xmas Festival Woluwe-Saint-Pierre is December 12-16 on Place Dumon. Mechelen Christmas Market runs from Dec 7 to Jan 6 with Christmas products, local crafts and Flemish cuisine. Winter Season in Leuven starts Dec. 5 in Grote Markt and ends Jan. 5. The Christmas Market in Eupen will have 50 chalets on the weekend of Dec. 14-16. Noel a Namur starts on Nov 31st and runs until Dec 31st. Experience the magnificent illuminations and the charms of the Old Namur. Mons Christmas Market is a colourful Christmas Market held in the Grand Place on Dec 7 -31. Christmas decorations at Chateau de Modave takes place from Dec. 15th – Jan. 6. Binche Christmas Market – Dec 7-16. Need a place to stay in Belgium? Book your hotel at the best possible rates. 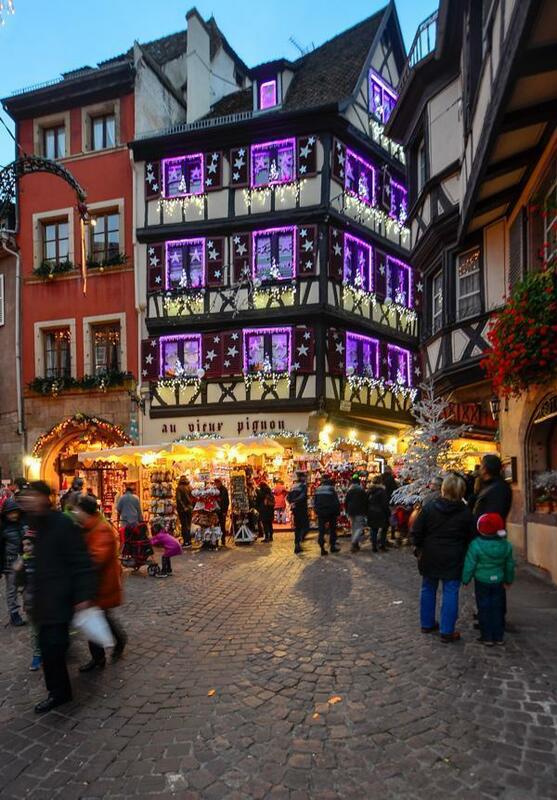 Who can resist the charm of Colmar at Christmastime? Paris Christmas Markets start in Late in November and will last until a little after the New Year. Strasbourg – Capital of Christmas continues the tradition of an authentic, warm and generous Alsatian Christmas starting Nov 23 until Dec 30. Reims Christmas Market Inside their small 125 wooden chalets, the shopkeepers of Reims will display gifts, gastronomic products and Christmas decorations, between 21 Nov- 28 Dec.
Mulhouse Christmas Market Named ‘Les Étofféeries‘, Mulhouse’s Christmas market has become very popular in Alsace over the years and this year will start on Nov 24 until Dec 27. Rouen Christmas Market “Frosted Rouen” will have events with animation, lights, children entertainment, food, an ice rink in the City Hall square and a Ferris wheel in the Cathedral Square, from 28 Nov to 30 Dec.
Caen Christmas Market, The Spirit of Christmas village is set up with sixty chalets spread over the entire length of the Place St. Sauveur, starting Dec 1 until Dec 31. Read all about the Best Christmas Markets in Germany! Dusseldorf Christmas Market between Nov 22 and Dec 30, Düsseldorf in Advent is an exciting mix of Christmas markets and shopping delights, especially around the Königsallee. Cologne Christmas Market the city centre is touched by the magic of the winter festivities starting Nov 26 until Dec 23. Monschau Christmas Market is one of Germany’s most picturesque and takes place on Nov 23 until Dec 23. Stuttgarter Weihnachtsmarkt Located in the heart of the Baden-Württemberg, the state capital opens its doors for the Stuttgart Christmas market from 28 Nov to 23 Dec.
Nurnberger Christkindlesmarkt Experience Germany’s Number 1 Christmas City with its world-famous Christkindlesmarkt and dive into the one-of-a-kind atmosphere of the festively decorated Old Town, from Nov 30 to Dec 24. 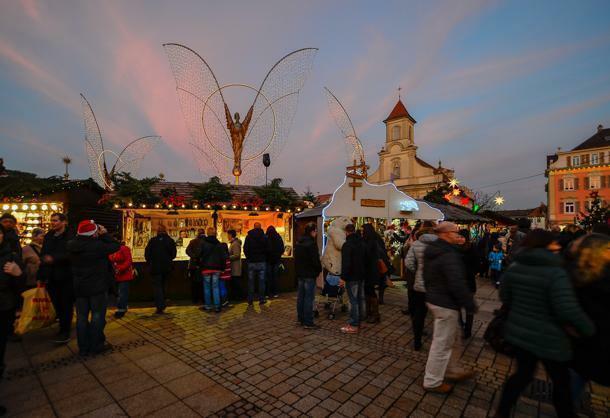 Esslingen Medieval and Christmas Market from 27 Nov until 21 of Dec the medieval market nation takes possession of the city, for four weeks before Christmas. Jugglers, fire-eaters, storytellers and musicians, scale makers, broom makers and glass blowers celebrate old craft from distant days. Above all is the smell of charcoal fire and exotic spices, spiced wine, of roast and boiled meats. Bamberg Christmas Market the Maxplatz is transformed into a pre-Christmas festival site, in the middle of the old town, with its lights and decorated shops. The smell of sausages and roasted almonds, mulled wine and gingerbread are everywhere from 22 Nov – 23 Dec.
München Weihnachtsmärkte The Christmas Market at Marienplatz gets around 3 million visitors and about 180 vendors in the largest and oldest Christmas market in Munich, from 27 Nov – 24 Dec.
Christmas in Hamburg The Historic Christmas Market at the Town Hall Square opens its doors from 26 November to 23 December. Frankfurt Christmas Market Germany’s largest Christmas Market is open from Nov 26th until Dec 22 at Mountain Romans, St. Paul’s Square and Mainkai. On Christmas Eve, from 17 to 17.30 clock, do attend the worldwide unique Frankfurter “Big city bells” when the 50 bells of the 10 churches in the centre of town unite for a 30-minute concert. There is a wide variety of Christmas Markets in Berlin. Check out the huge listing and choose your favourites. Need a place to stay in Germany? Book your hotel at the best possible rates. Christmas Season in Amsterdam starts Dec 1 and lasts throughout the month. Magical Maastricht is celebrating on a grand scale this year with plenty of holiday gifts from Dec 1 to 31. Christmas Town Valkenburg aan de Geul Visit the attractive and cosy Christmas Market in the Velvet Cave between 16 Nov and 6 Jan.
Christmas in Dordrecht On the 14-16 of December discover the Christmas Market in Dordrecht, with over 200 stalls and pagoda tents, it’s one of the largest Christmas Markets in Netherlands. Dicken’s Festival in Deventer The yearly Dicken’s Festival is a massive Victorian Era re-enactment in the heart of Deventer featuring the characters of Charles Dicken’s most famous novels. 15-16 December. Haarlem Christmas Market The Christmas Market is spread throughout the centre on the weekend of 8 – 9 December. WinterWelVaart in Groningen From the 8 to 9 December, for those located in the north (or willing to travel), the WinterWelVaart in Groningen is a nice mix of market and Christmas events using the waterways. Leiden Christmas Market One of the newer Christmas markets in the Netherlands, the event in Leiden is unique due to its layout. With temporary scaffolding set over the central Nieuwe Rijn, the entire market takes place on the water. Dec 15 to Dec 27. Dark Days of Delft The entire historic city centre is magically lit. Artists will make you relive the times of Charles Dickens.Bands and choirs produce a cheerful Christmas feel. It goes without saying that fire baskets, hot chocolate, mulled wine and pea-and-ham soup will not be missing. Dec 11 to Jan 5. 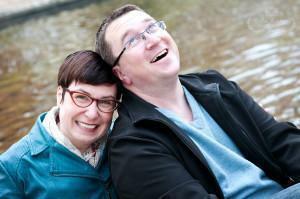 Need a place to stay in The Netherlands? Book your hotel at the best possible rates. Manchester Christmas Markets The Christmas Markets have become not just a fabulous place to shop but also a hugely popular leisure destination in its own right, from Nov 9th to Dec 23rd. Christmas in Cirencester This quaint Cotswolds town is full of Christmas activities and events, from skating in the Abbey Grounds of the parish church to a lantern parade. You can explore gourmet foods from the Charter Market, antiques at Corn Hall as well as clothes, accessories and crafts from festively decorated chalets, from Dec 1. Exeter Christmas Market The Cathedral Green, at the heart of the city centre, will be brought to life by the Market, with stalls offering unique, handmade and unusual gifts, decorations and food items, from Nov 15 to Dec 16. Edinburgh’s Christmas The Christmas Market will, for a second year this year, stretch from the Mound, along East Princes Street Gardens Terrace and around the Scott Monument, from Nov 16 to Jan 5. London’s Winter Wonderland The Christmas Markets give you plenty of choice across more than 200 fairy lit Bavarian style wooden chalets. You’re sure to find all you need for the festive season, from Nov 22 to Jan 6. Salisbury Christmas Market From Nov 29 to Dec 23 come to Salisbury’s lovely and very British Christmas Market! Christkindelmarkt in Leeds Millennium Square will once again transform into a scenic winter village, with over 40 traditional wooden chalet stalls decorated with festive greenery and twinkling colourful lights, themed indoor venues and the traditional Christmas carousel ride, Nov 9 – Dec 22. Birmingham Christmas Market & Craft Fair The largest authentic German market outside Germany and Austria and the centrepiece of the city’s festive event calendar returns to Birmingham each year from 15 Nov – 22 Dec.
Nottingham Christmas Market and Winter Wonderland This “Old England” themed event features a stunning ice rink, Christmas market trader cabins, two themed winter bars, a bandstand, rides, timber decked walkways, nativity scene, 100’s of real Xmas trees, snow dressing and much more. Nov 16 – 31 Dec.
Swansea Christmas Market and Waterfront Winterland Swansea’s award-winning Christmas attraction returns 16 Nov, at Museum Park with all the magic and wonder of the festive season right in the heart of the city. Glasgow Loves Christmas The only place you can skate under the stars in Glasgow city centre and will include rides (including the return of the Big Wheel! ), free activities for children and families in the Christmas Workshop and themed nights on the rink. Bath Christmas Market The Bath Christmas Market offers 18 days of magical festive shopping, as the areas between the stunning Bath Abbey and the renowned Roman Baths are transformed into a Christmas shopping wonderland. 22 Nov – 9 Dec.
Belfast Christmas Market The ever-popular Belfast Christmas Market is on 17 Nov, offering a range of unique gifts, gourmet food and drink to cater for the savviest of shoppers! Oxford Christmas Market Discover the Oxford Christmas Market with all the goods and treats it has to offer, from the 7th to the 22nd of December. York’s St. Nicholas Fair From Nov 15 to Dec 23 there’ll be lots to celebrate, including a rolling programme of different market stalls throughout the Fair, and specialty stalls featuring food, sparkles and toys. Christmas in Winchester Enjoy the Christmas Market which will be running daily from 17 Nov to Dec 22, or don your hat and gloves and head to the Christmas ice rink. Need a place to stay in the United Kingdom? Book your hotel at the best possible rates. If you know of more Christmas happenings we’ve missed, contact us, with the relevant information (please include dates and website links) and we’ll share it on this page.